In Baker’s revision to the proposed legislation, extended antibiotic treatment would be covered–but only when prescribed by rheumatologists, neurologists or infectious disease doctors. If passed, the law, therefore, would disallow antibiotic therapy to be prescribed by physicians most likely to treat patients who suffer from persistent Lyme disease–tickborne disease specialists who belong to the International Lyme and Associated Diseases Society (ILADS). Neurologists and rheumatologists who suspect Lyme or another infectious disease are most likely to refer their patients back to their general practitioners for a referral to a Lyme or an infectious disease specialist. Objectively, the claim that “long-term antibiotic therapy is not clinically recognized as an appropriate form of treatment at this time” is false. Major differences of opinion represented in the IDSA and ILADS treatment guidelines are the source of much controversy and dispute among doctors and patients alike. Many patients have partially to fully disabling illnesses prior to antibiotic treatment and regain wellness after prolonged treatment. While the IDSA claims that there is no evidence to support persisting/chronic Lyme disease, as of 2015, over 700 peer-reviewed medical journal articles observed and discussed Lyme disease persisting following standard short-term treatment with doxycycline. The IDSA rejects this body of research, which continues to grow, while ILADS accepts it and considers it evidence for Lyme disease bacteria persisting within the human body. First, according to the given statement, Baker has been persuaded to believe that prolonged antibiotic treatment does not work–yet his law would give three medical specialists the freedom to prescribe long-term antibiotics to Lyme patients: rheumatologists, neurologists, and infectious disease specialists. Why, if the change was made on the basis of prolonged antibiotic therapy being ineffective, would he allow all these specialists but not Lyme disease specialists to prescribe longer-term antibiotics? This hypocrisy reveals a clear bias toward the IDSA opinion and against the opinion of ILADS, which represents exclusively medical doctors who treat Lyme and other tickborne diseases. Second, most infectious disease specialists adhere to IDSA treatment guidelines and so most would not readily administer longer-term antibiotics–and so the governor’s decision to leave such a decision to an infectious disease specialist appears to undo itself. This provision is akin to prohibiting drinking alcohol except to those who have sworn never to have had a drink of it. A Boston Globe article published this morning revealed that Baker is a former health insurance executive, having served as the CEO of Harvard Vanguard Medical Associates. Now known as Harvard Pilgrim Health Care, this insurance company is one of several that make up Atrius Health Medical Practices. When I asked Baker’s spokesperson why he chose to strike proposed mandatory health insurance coverage for Lyme disease treatment by Lyme specialists, his spokesperson provided the documents linked above. One of these is a letter from Atrius Health. 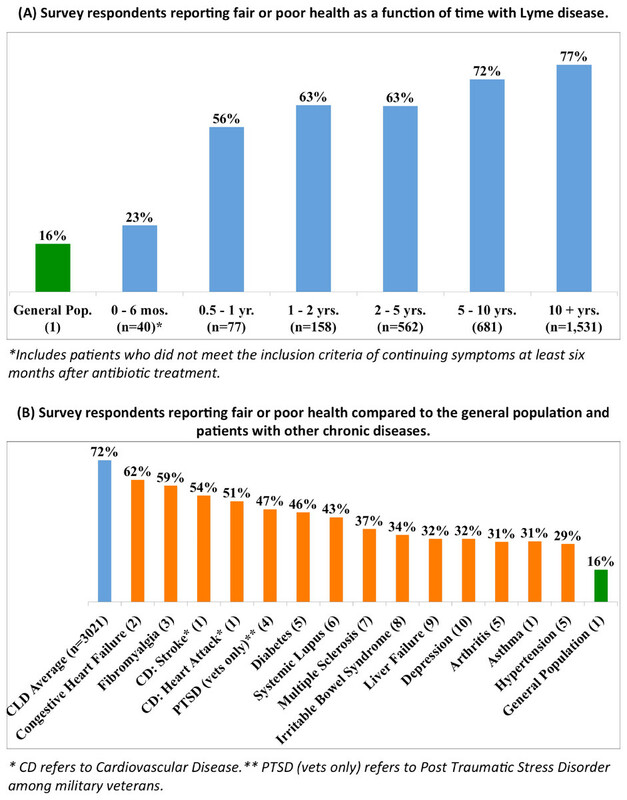 Some of the reasons cited in these letters for not prescribing longer-term antibiotics for Lyme include placing patients at risk for “allergic reactions, bloodstream infections as a complication of indwelling intravenous catheter, disruption of normal microbiota, and development of antibiotic-induced diarrhea.” The antibiotic-related risks apply, as well, to any prolonged antibiotic treatments, such as those commonly prescribed by dermatologists for acne and by urologists for long-term uninary tract infections. The MIDS also states a concern about the overprescription of antibiotics creating antibiotic-resistant “superbugs,” which is a viable public health concern. However, this concern is stated almost exclusively in the context of Lyme disease, and used as an argument against treating Lyme. The doctors and public health officials who cite is rarely, if ever, discuss longer-term antibiotic treatments of acne, bladder infections, tuberculosis, etc. Why? I spoke a few weeks ago with an antibiotics expert from the CDC, and she explained that even if all human beings were to cease being treated with antibiotics, we should still expect a rapid and pronounced rise in “superbugs” because of animal farming practices in which cattle, chickens and other livestock are fed copious amounts of many different antibiotics–often every day of their lives–to prevent infection due to greatly overcrowded living conditions and especially to accelerate muscle growth. It is strange that Lyme disease treatment is cited by the IDSA as a primary contributor to the rise of superbugs, while federal public health authorities have little care and no power to address super-dosing of food animals with a variety of antibiotics, as oversight for this is assigned exclusively to the FDA. The FDA has made some headway, but is this not a human public health concern, as it poses a far greater risk of promoting antibiotic-resistant bacteria? The answer seems to be no: Lyme disease treatment, for reasons unexplained, is consistently identified as the primary concern. Why? Lyme disease is caused by Borrelia burgdorferi, a syphilis-like spirochete type bacterium. While probably–hopefully–unrelated, it is a truly peculiar coincidence that today, in 2016, the CDC and its favored Infectious Diseases Society of America prohibit antibiotic treatment of Lyme disease even when patients frequently recover significantly from their Lyme symptoms as a result of antibiotic treatment. From 1932 until 1972, the federal Public Health Service, the precursor to today’s CDC, conscripted a great number of medical doctors to willfully abandon their Hippocratic oath to “do no harm” and surreptitiously monitor the declining health–in many cases to the point of death–of black men who had syphilis. These men were not told by their doctors that they had syphilis. They could have been cured by a simple penicillin shot but instead were used as human laboratory animals who suffered and/or died as a direct result of medical doctors and the Public Health Service’s inhumane and grossly unethical protocols. Today, the CDC asks doctors to refuse to treat Lyme disease patients for longer than 28 days even when the treatment returns their health and wellness. The doctors who refuse to let their patients suffer needlessly are persecuted. The coincidence of Lyme’s relationship to syphilis and the prohibition of treatment is disturbing. The correct answer is that the study was, to be blunt, evil, and it never should have happened. That is not a perspective shared by the CDC according to material on its website. The IV catheter risks cited in the MIDS letter apply to many patients: a 2013 article in The Neurohospitalist stated that this practice “has become very common,” with “about 150 intravastular devices” used every year within the United States, and by no measure is the risk associated with treating Lyme disease this way greater than it is to treat any other illness. This has been my experience to date, as well, and that of countless people who have been diagnosed with Lyme disease–yet authorities such as Governor Baker for specious reasons have determined that 1) those who treat infectious diseases but argue against treating Lyme disease know better than patients and than those who exclusively treat Lyme disease; 2) that those who treat Lyme disease exclusively–board-certified medical doctors–all are wrong when the members of a competing medical association all are correct; 3) all peer-reviewed, published research numbering over 700 articles should be discarded because the preferred medical organization rejects it for unspecified reasons; and 4) that those who experience Lyme disease themselves do not know their bodies as well as IDSA member doctors do, and that in every case remission of symptoms while prescribed antibiotics is an imagined phenomenon. Baker’s spokesperson also emailed two documents supporting his decision: A March 29, 2016 Boston Globe editorial petitioning legislature to reject the treatment mandate, which was coincidentally published two days prior to a paper published in the New England Journal of Medicine, which was the basis for a Forbes article proclaiming that “Long Term Antibiotic Use for Lyme Disease Doesn’t Work, Study Says.” Never mind that the study reached no such sweeping conclusion. Never mind science. I pointed out, which I have done before, that the NEJM article was limited to treating Lyme patients with two select antibiotics for an arbitrarily determined three-month term; its conclusions, therefore, are limited and do not account for other antibiotics not tested, for other drug combinations, for newer modes of antibiotic administration such as pulsed dosing, or for terms longer than three months. In fact, many Lyme patients experience no improvement in symptoms for six months or longer–which was my personal experience. I asked whether Governor Baker had considered these points, or letters submitted by Lyme disease specialists, support organizations or patients in his decision. I also asked by Governor Baker had determined that the IDSA approach to treatment is superior to the ILADS perspective, especially when the IDSA guidelines were removed from the federal Institute of Medicine’s National Guidelines Clearinghouse earlier this year because they were determined to be outdated and in need of review against scientific findings from within the past decade. (Consider how many medical and scientific discoveries are made over such a span of time. In the case of Lyme disease, they have been extraordinarily insightful.) The ILADS guidelines have been accepted into the National Guidelines Clearinghouse and are provided by the IOM as a resource for physicians who treat Lyme disease. In short, this branch of the Department of Health and Human Services has determined that doctors should use the ILADS guidelines and not the IDSA guidelines at this time. I also pointed out that several weeks ago, an infectious diseases specialist convened a “Lyme hackathon” to fill in research gaps that the federal government has failed to address, and that this event was supported by MIT, Harvard University Medical School and the Department of Veterans Affairs. The specialist told me that infectious disease doctors are “data dumb” and are not addressing Lyme disease adequately. To date, I have received no reply to any of these questions. Happy to report that the Massachusetts Senate & Reps pass the original bill with enough vote to veto the governor’s action. The bill requiring insurance coverage will go into affect. Thankfully the Masschusetts legislators had enough votes to overwrite the governor’s veto. Insurance companies in MA are now required by law to pay for antibiotics beyond 30 days. Yes, thankfully. I hope that when these sorts of corrupt actions happen in other states, those states and nationally those who have the means will fight back as competently as happened in Massachusetts. For now, the U.S. has a constitutional crisis and we are on the verge of losing all of our rights and freedoms, and many of us could lose our citizenships or even our lives depending how this goes. More needs to happen – keep digging! Thank you. I’m doing my best, but the new totalitarian regime has scrambled my brain and displaced most of my efforts. I fear the worst for our country in ways that greatly supersede Lyme disease.